HomeWhich are the 10 Scariest Airports in America? I’ve flown in and out of many airports in my time, encountering the usual plane delays and occasional rough-weather bumpy rides along the way. But the most frightening airport I think I’ve ever experienced is the one in Charleston, West Virginia. It’s situated on top of a mountain, and the runway ends mere feet away from a cliff-like drop-off. Other people I’ve spoken with are spooked by the airports in San Francisco and Boston, where the runways protruding into the ocean give the eerie sensation of landing on water. In any case, when Airfarewatchdog.com came out with its “Top 10 Scariest Airports in America” ranking recently, I wasn’t surprised to see that the Charleston airport made the list. #1 Scariest: Reagan Washington National Airport, Washington, DC – Perched precariously as it is between two overlapping no-fly zones, approaching and leaving this airport is akin to threading a needle. #2: Telluride Regional Airport, Telluride, CO – It’s the highest-altitude commercial airport in North America, with no touch-and-go landings permitted. Basically, the pilot gets one shot to land the plane. #3: Catalina Island Airport, Avalon, CA – Its elevation and location on the edge of the island makes planes prone to major-league turbulence and downdrafts. #4: LaGuardia Airport, New York, NY – As Airfarewatchdog.com puts it, the airspace around this airport is “uniquely crowded” (read: dangerous). #5: San Diego International Airport, San Diego, CA – It has a downtown location. No more needs to be said. 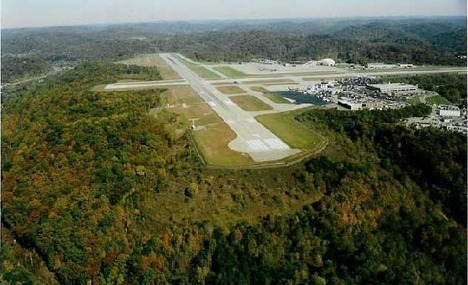 #6: Yeager Airport, Charleston, WV – My “favorite” white-knuckle airport makes the list: the one with the runway atop a mountain that’s situated between two ravines. #7: Rocky Gutierrez Airport, Sitka, AK – Obstacle course ahead: When the weather is stormy, rocks and other debris pile up on the runway at this island airport facility. #8: Midway Airport, Chicago, IL – Short runways and a “convenient in-town location” make for some interestingly rapid dropdowns from the sky … not to mention “pull-back-on-the throttle” takeoffs. #9: John Wayne Airport, Santa Ana, CA – Air sickness bag alert: Appropriately Californiaesque state and local noise restrictions require takeoffs at full throttle … then cutting back immediately on the engines. #10: Pitkin County Airport, Aspen, CO – The exact opposite of Charleston, WV: This airport is situated in a valley wedged between two mountains – no doubt massively fun during one of Aspen’s notorious snowstorms. Based on your own experiences, which one of these airports should be ranked “#1 Scariest”? … Or are there other U.S. airports that you think qualify for “Top 10” honors? I’m sure other readers would be interested to hear your perspectives. ← Is it time to change daylight savings time – and time zones – once and for all? Having flown in and out of five of these ten airports plenty, theoretically Reagan National is pretty scary, especially when it looks like you’re landing in the Potomac River on the approach. But I’d have to say Telluride was the scariest one for me. On one particular trip the wind shear was so severe, and the plane shook so much, that I was unsure if we could land safely. The most unusual/scary takeoff and landing I experienced outside the U.S. was going in and out of Joshua Mqabuko Nkomo International Airport in Bulawayo, Zimbabwe. In order to avoid stray gunfire from local guerilla warfare, we took off almost straight upwards, like a rocket. When landing there, the plane banked so sharply for the approach, that I was looking directly at the ground through my window from about 500 feet. You can be sure that was scary! Try Tangiers and Casablanca, with charter pilots unfamiliar with the deceptive runway layout. What seems to be the runway (lights and all) turns out not to be and it takes a last-second offset to get in. Or try Denver, which, depending on weather, has you come in over a long stretch of golf course-like hills and thermal “bumps”. … Not to mention Berlin Tempelhof Airport, smack in the middle of the city, with wing-tips nearly scraping the multi-story post-war apartment buildings on both sides of the runway. They actually managed even with early 747s. Switzerland is full of goodies, like thousand-feet or less mountaintop runways. My brother-in-law is a pilot and he finds San Diego difficult. The scariest landings I’ve ever experienced, hands down, were at the old Hong Kong airport (Kai Tak) which was closed down in 1998. It had a single runway jutting out into Hong Kong Harbor, so you definitely had the sensation of landing on water when approaching from the south. The approach and landing from the north was done by flying alongside a mountain range to about 650 feet above sea level, straight toward a big target painted on one of the mountains, and then making a hard right turn just 2 miles away from the end of the runway. During that final turn, the plane (usually a Boeing 747-400 jumbo jet arriving from someplace like Los Angeles after a 13-hour flight) would drop from 650 to 140 feet above sea level. This was all done over central Kowloon which is a forest of high-rise towers. During the turn you could look out the window and visually pick out specific pieces of furniture in peoples’ apartments. I’ve flown into 5 of the top 10 scariest American airports you listed, but those experiences never came close to a Kai Tak landing. However I would add 1 more to the American list: El Paso International Airport. Not only is it quite close to downtown El Paso, it is a mere 3 miles from the Mexican border and the city of Ciudad Juarez. When taking off toward the southwest, to avoid Mexican airspace, the plane has to make a hard right or left turn immediately after takeoff. Descents into El Paso can also be pretty steep. It’s a bit similar at Seoul’s new Incheon International Airport, which sits on an island just 30 miles south of North Korean airspace. Not only do you have the sensation of landing on water as in San Francisco and Boston … you never know what those pesky North Koreans might be thinking or planning!